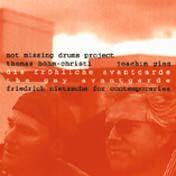 The fourth release on Leo Records by Not Missing Drums Project led by Joachim Gies and Thomas Bohm-Christl with yet another change in the line-up: Ute Doring (mezzo-soprano), Alex Nowitz (voice, electronics), Matthias Bauer (voice, bass), Jorg Huke (trombone). Based on the works of Friedrich Nietzsche, the music of the "Gay Avantgarde" cannot be defined by a single style. The styles range from atonal chamber music to interactive composition, improvisation to sound collages, and the music on this CD breaks through the usual barriers between genres.